She made several things. As usual, I showed her how to do something new. This time it was embossing with pigment ink and embossing powders. She did a great job! 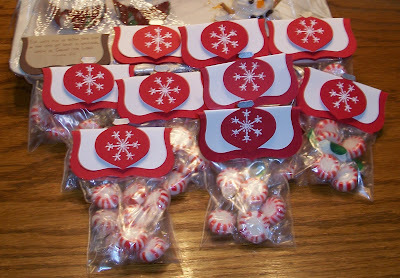 First off, she began making some peppermint treat bags for some of her friends. After filling the little bags, staple a large red Labels 1 piece on it. Place the next smaller Labels 1 white piece over it attaching it with double sided tape to hide the staple. Emboss a snowflake in white on a piece of Real Red cardstock. Punch out with SU's new Ornament punch (I love this punch!!). Using the ornament punch, I took some scrap silver paper and punched out just the top part. Trimming it if necessary to fit the red ornament already punched, I used some liquid glue to attach it. Raise the ornament with a foam dot and put on to complete. This one is a close-up of the first one she made, but then decided she wanted to go red and white. She, also, made snowman cupcakes and wanted to share these with you, too. The head is made with a large marshmallow on top of the already iced cupcake, iced, and decorated. She had so much fun doing these. Here she is holding one that is decorated only with the gel icing. She's the prettiest thing, don't you agree? Thank you for your comment on my blog! Lovely treat bags and it looks like you had a fab day! Hope you continue to visit my blog, I've now begun following yours also. What great treats! How fun to be able to share stamping with your grandaughter!!! The treat bags are very cute and what a wonderful way to spend time to spend with your granddaughter.